Dental implants offer an innovative and effective solution for those who have one or more missing teeth. The posts act as tooth roots and provide a sturdy foundation for restorations such as crowns, bridges, and dentures. Dr. Garrick Denny offers dental implants in San Pedro as part of his wide array of treatment options for compromised smiles. 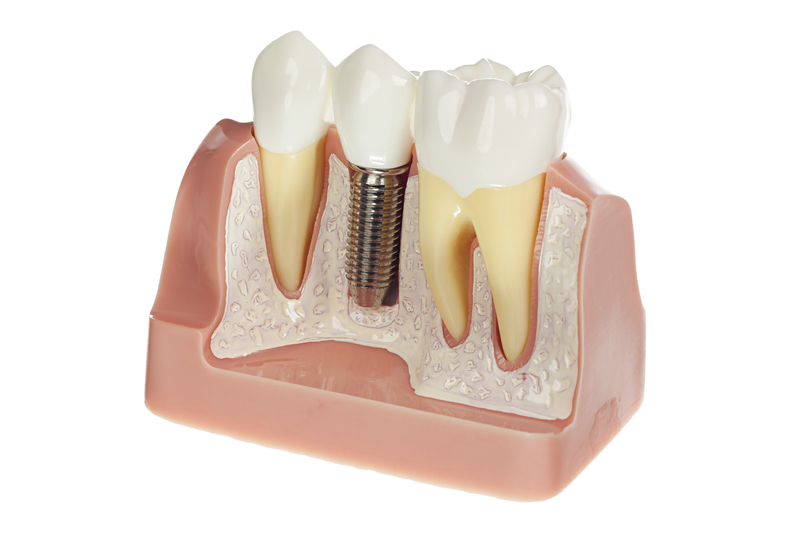 Dental implants provide patients with a number of long-term benefits. When compared to traditional tooth replacement solutions like traditional dentures and fixed bridges, dental implants are an economically-savvy and long-lasting alternative. Biocompatibility: The artificial tooth root is typically made of titanium, a biocompatible metal that stimulates the jaw by mimicking the natural tooth root. This compatibility triggers integration with the bone, causing the implant to fuse to the jawbone, creating a strong anchor for your restoration. Preservation of the Jaw Bone: When people lose teeth, the missing tooth root causes the supporting bone structure to gradually recede. Once the bone is gone, it is impossible to get it back without surgical intervention. Dental implants prevent this slow recession as the replacement root maintains the natural bone growth cycle. Long-term Stability: As dental implants are fixed to the jaw, this replacement won’t become loose or move around like dentures. With dental implants, patients are not restricted in their food choices and their speech patterns are left unhindered. Natural Feel & Function: Dental implants are specifically designed to look, feel and function just like your natural teeth. When making the crown restoration that sits above the implant, Dr. Denny takes your smile into consideration. Your crown is made to match the surrounding teeth, ensuring a seamless smile. Dental implants are the only truly permanent solution for replacing missing teeth. For patients who may be nervous about the procedure, our San Pedro dental implant provider is highly skilled and experienced in the procedure and offers oral conscious sedation and nitrous at no additional charge. If a full or partial tooth remains, the extraction and implant placement can be done at the same time. If necessary, a bone graft can also be done in order to preserve bone material to support the implant. For patients who are missing multiple teeth, implant-supported dentures provide a stable alternative that is more affordable than having multiple individual dental implants. Implant-supported dentures use a series of implants as a base for connecting full or partial dentures, providing an extra degree of stability, so patients don’t have to use adhesives. If you are missing teeth, dental implants offer the most natural answer.